I've touched upon this topic briefly in my other mouse posts but i wanted to clarify exactly why adjusting your mouse sensitivity, via the windows control panel, is a bad idea. You know who you are. The ones that claim that their first generation, 800 DPI(dots per inch), optical mouse is fast enough. Oh these people will say the same things over and over, it's really like watching paint dry. "But it's comfortable", "I've had this mouse for years", or the notorious, "it's fast enough". Unfortunately their sole justification for their mouse being fast enough is because they've artificially jacked their sensitivity via the Windows control panel. I'm sorry, but increasing windows sensitivity does not equal to having a greater DPI. Sensitivity is simply a math formula which causes loss of precision. Everytime you increase or decrease your sensitivity by even a notch, you're causing your mouse to skip data and "predict" where you are aiming. 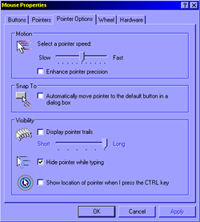 Do not use the Windows sensitivity slider found under "Control Panel/Mouse"(pointer options tab). Just as i explained above, sensitivity does not equal DPI. You WILL lose precision. While i don't recommend modifying your in-game sensitivity via the console either, I can say with 100% conviction, avoid the Windows sensitivity slider at all costs. It is much better to set it to the 6th Notch, which i believe is the default value. I have done numerous tests in Paint to show you just how bad the results are if you modify your sensitivity in this manner. As you can see from the image above, the text on the left (default mouse sensitivity) appears quite clear and very few jagged edges are present. Unfortunately, as seen on the right above, once you change your mouse setting to the maximum setting, your precision becomes terrible as the formula to increase the sensitivity is skipping data causing extremely blocky or jagged edges. 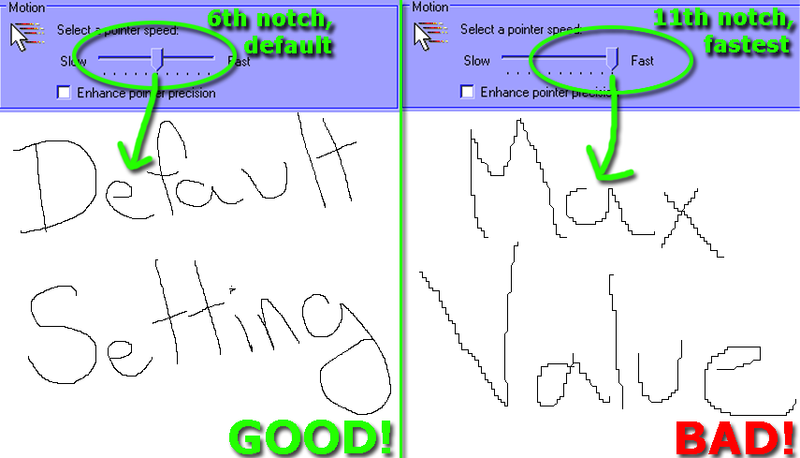 It does not matter if you are in Paint or any other application, your precision will be terrible..
Leave your Windows mouse sensitivity slider to the default position (make sure it's set to the 6th notch from the left). If that's not fast enough for you, go buy a mouse with a greater DPI, you won't regret it!